1. He is 6ft 3in, he weighs in at nearly 18st... and Samy Kibula is still only 18! He became the 40th academy-product to debut under Shaun Wane’s watch, coming off the bench in the first-half for a stint and reappearing for a second spell later on. Many who watch Wigan’s Under-19s have been clamouring for him to get his Super League chance. Kibula used his size to good effect with his first carry, powering forward with two defenders clinging to him until a third brought him down. But he was desperately under-used in attack, with most of his contributions being a solid spell in defence. Still, with Joe Greenwood recently joining and Kibula poking into the mix, Wane has the option of using some bigger forwards in the home-straight. 2. And yet it was one of the smaller forwards who arguably impressed the most. Romain Navarrete was constantly buzzing about, tackling, niggling, driving - if Wigan handed out a ‘most improved’ award, he would surely be the favourite. 3. It was not Wigan’s night. They scored first through Sam Tomkins’ early converted effort, but the game slipped away. The loss of Sean O’Loughlin to a recurrence of a calf strain midway through the first-half hurt their cause. Their discipline frequently cost them - Gareth Hewer penalised them several times for ruck offences - and pressed them into long spells of defence. And when they did get the ball, they made a catalogue of errors (spills, kick-out on the full, forward passes, passes into touch). Their skill-level was nowhere near good enough. 4. Wigan are unbeaten at home this year, with nine wins from nine (including the match moved Down Under!). By contrast, they have won half - seven from 14 - of the matches on the road. It is a source of frustration for many that some of those away losses - Hull KR, Wakefield, now this - were matches which fell in the ‘winnable’ category, although Huddersfield’s recent form (eight wins from nine) shows they have become a decent side under new coach Simon Woolford. If Wigan’s contrasting fortunes home and away counts for anything, than perhaps the run-in to the play-offs offers some comfort – six of Wigan’s nine remaining league games will be at the DW. 5. Warriors remained second after this defeat, but result had a big impact further down the Super League table. 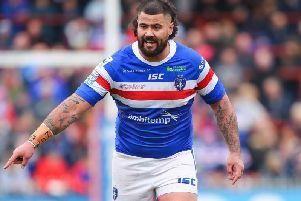 With Catalans drawing at Warrington, they both moved to 19-points - plunging Wakefield (18) into 8th position, ahead of ninth-placed Leeds (15). Intriguingly, Leeds and Wakefield meet in front of the Sky Sports cameras tonight. And if Leeds lose this match, they would need to win both their remaining matches (against Salford and Widnes) AND hope either Catalans or Huddersfield lose BOTH their last two games to avoid finishing in the bottom-four ahead of the split for the Super-8s. Things just got a whole lot interesting. As for Wigan, Castleford can close the gap to one point if they beat Salford tonight, while leaders St Helens can move eight points clear at the top of they overcome Hull FC.